Neither a good LEGO game nor tribute to the movieat best, The LEGO Movie Videogame is enough fun to be called a functioning promotional product. I didn't so much play The LEGO Movie Videogame as I did gently prod it toward a conclusion. I pushed the buttons that appeared on screen to automatically transform scattered pieces into spaceships and trampolines, performed mindless quick time events, and beat up enemies, though there was never a reason to use anything but the jump attack. It isn't much different from previous LEGO games. Each character has a special skill or two, and you can switch between them at any time to solve rudimentary puzzles. They also have different attacks, but these weren't different enough to make me choose one over the other. When I was able to do all this without friction, playing along with the intentions of the design, it was enjoyable enough to tolerate. It's colorful and fun to look at in the same way it's fun to look at grand, intricate LEGO displays (and then smash them to bits). For instance, there's a cool, Old West-themed level where my LEGO buddies and I ran from rooftop to rooftop, smashing water towers and reforming them into rickety bridges, and I was able to use the different characters in some interesting ways. At one point, Wyldtyle climbed up a wall and kicked down a ladder so that Vituvius could use his staff to walk across a narrow beam and build a bridge, allowing Emmet to fix generator with his wrench. Meanwhile, a crowd of police robots from below fired laser rifles, filling the sky with hundreds of little red beams. It's busy, silly, and fun to absorb in a passive way. A highway chase and other set pieces lifted from the movie unfold with minimal input, but with enough style and chaos to be entertaining. 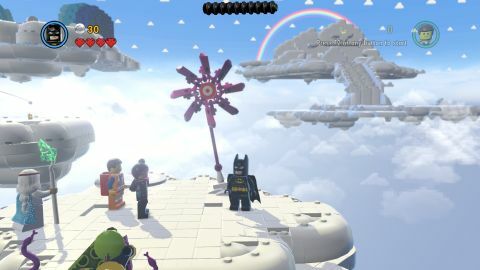 Chaotic silliness is The LEGO Movie Videogame's neatest trick. If it doesn't use it, it feels dead and boring. When it uses it too much, however, it becomes obvious that the chaos is just noise that doesn't affect how you play, and the noise gets exhausting. It never finds the right balance. Worse is that the game is at times legitimately broken. A bug that stuck the camera in a forced position left me no choice but to Ctrl+Alt+Delete. Another, in which my character was stuck in the level's geometry, forced me to restart. Both happened in my first hour with the game, and required me to repeat the same 15 to 20 minutes of gameplay. These bugs, however, manage to be less frustrating than instances when the game is just poorly designed. Whenever I would run around in circles trying to figure out how to keep prodding things along, I wasn't sure if it was a glitch or if I was too dumb to figure it out. It usually turned out that the game just expected me to know things I had no way of knowing. By far the most maddening example of this is near the end of the game, where I was piloting a giant mech and needed to destroy a huge pipe that blocked the street. The pipe was cracked in such a way that it's obvious that it needed to be smashed, but beating it up didn't help. Moments before, I was taught that the mech could pick up cars and toss them, but these did nothing either. Finally, through desperation and a little luck, I discovered that the only way to break the pipe was to backtrack (something you rarely need to do) and pick up a very specific car, in a way that was different than the method I was just taught. I'm fuming just remembering it. If it weren't for the interspersed footage from the movie, I would have thought that the LEGO games had reached a point where they're more or less photorealistic—they look like LEGO. But what makes the movie so much more visually interesting is that it represents LEGO as I actually remember it from my childhood. A little scuffed, a little broken and clunky. Juxtaposed with this, the game seems lifeless, without history, with factory fresh pieces. Another inadvertent downside to the source material is that it negates a lot of the what was inherently endearing about previous LEGO games. There was a parody to their portrayals, a self-aware smoothing over of the most dramatic scenes in Star Wars or The Lord of The Rings. A character's tragic death was transformed into comedy, and part of the fun was watching memorable moments reimagined in LEGO. It's right there in the title: “The LEGO Movie Videogame” is a description of marketing. President Business would be pleased. Multiplayer: Two player local co-op.